The United States of America wanted to redefine itself culturally after it's victory in WWII. Riding on the back of Modernism, New York in the 1940's and 1950's became the cultural capital of painting (and arguably, Modern Art as a whole). The Cold War was a significant factor in the development of Abstract Expressionism. Even the CIA encouraged the development of a new style of art in America that celebrated the Individual. 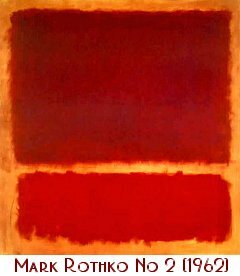 A critic, Clement Greenberg, was probably the most critical figure in this creation of this new movement which became known as Abstract Expressionism. 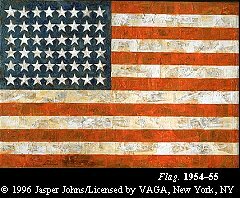 Ironically, most of the leading painters in the core of this movement were actually European, but it was seen (or at least, marketed) as a uniquely American movement. Trapped in his own cliche, "Jack the Dripper" was not the first person to paint by gloobing drips on a canvas on the floor - nor did he come to the idea himself. Pollock was known to have seen the works by Janet Sobel before experimenting and perfecting the technique himself. His type of Abstract Expressionism was known as Action Painting. 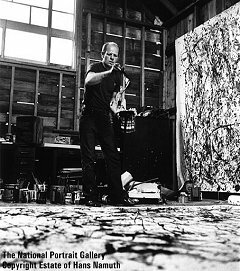 His self-destructive personality, heavy drinking and the sheer rage that showed in his works added to the mytique, the romantic 'wild man' myth of Pollock. If you're interested in seeing a Hollywood film featuring Abstract Expressionism, rent the movie "Pollock" from Planet Video or another good video store. 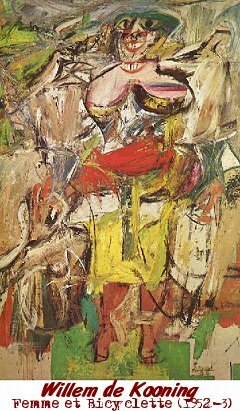 Dutch-born De Kooning's thickly-painted works were sometimes more figurative than other Abstract Expressionists. I can't help but think he didn't like women much. Pop Art had it's roots in London in the Swinging Sixties. 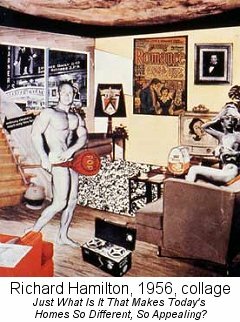 Richard Hamilton's collage "Just What Is It That Makes Today's Homes So Different, So Appealing" is credited with giving the name "Pop Art" to this new Movement. The Movement was quickly appropriated by the Americans and perfected by Andy Warhol, who saw it as the perfect synthesis of culture and economics. 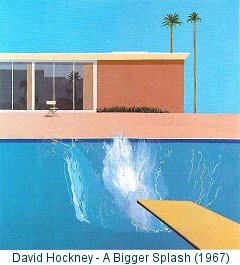 English-born LA resident David Hockney does not accept the label of 'Pop Artist', although this is the category into which he best fits. His work ranges from collages of photographs stuck together to his stark paintings of splashes in swimming pools. "Andy Warhol began as a commercial illustrator, and a very successful one, doing jobs like shoe ads for I. Miller in a stylish blotty line that derived from Ben Shahn. 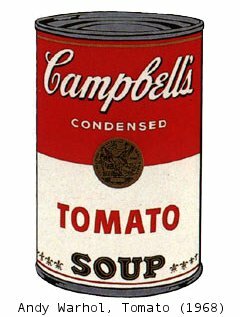 He first exhibited in an art gallery in 1962, when the Ferus Gallery in Los Angeles showed his 32 Campbell's Soup Cans, 1961-62. From then on, most of Warhol's best work was done over a span of about six years, finishing in 1968, when he was shot. And it all flowed from one central insight: that in a culture glutted with information, where most people experience most things at second or third hand through TV and print, through images that become banal and disassociated by repeated again and again and again, there is role for affectless art. 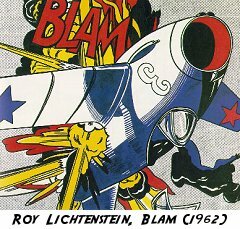 Lichtenstein blew up pictures from comic books and then painted them in meticulous detail, by dotting the paint to mimick the printing process. Creator of "Combines" - three dimensional multimedia works created by juxtaposing found objects and paint. His "Combines" remind me of the Dada/Merz artist Kurt Schwitters. 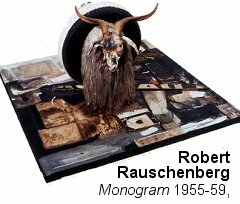 Sometimes Rauschenberg is counted as an Abstract Expressionist, although his strengths as an artist came to the fore in the Pop Art period. Today, he is still an important artist working much of the time on giant collaged monoprints. His work is hugely varied, and he constantly experiments with new media. 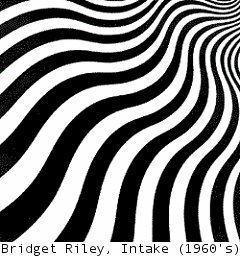 "Optical Art is a mathematically-oriented form of (usually) Abstract art, which uses repetition of simple forms and colors to create vibrating effects, moiré patterns, an exaggerated sense of depth, foreground-background confusion, and other visual effects.